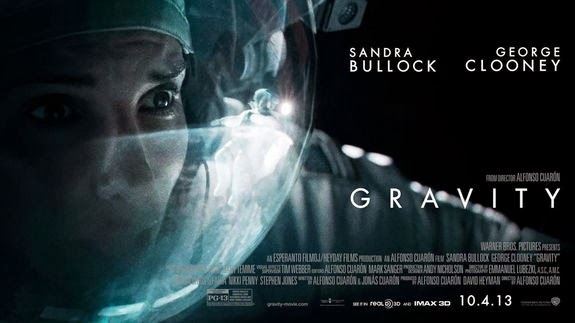 I Me My: Alfonso Cuaron's "Gravity" Grounds the Audience! Can a Movie do More? Alfonso Cuaron's "Gravity" Grounds the Audience! Can a Movie do More? No surprise that Alfonso Cuaron’s movie “Gravity” has pulledin so much money within a few weeks of its release, and this even before it has reached cine goers in China and India! A captivating movie about two lonely astronauts adrift in outer-space surrounded by an uncaring cosmos. I enjoyed the movie despite some spoilers on the plot and nitpicking on the veracity ofdetails associated with the science of outer space. Not only did the movie keep me at the edge, but it also raises some very philosophical questions about our existence on earth. The visuals of the earth from outer space are an absolute delight! In the midst of the space disaster our blue orb of life, so lovingly held within the wooly white whirl of clouds, appeared a haven of comfort and joy. I am sure that at various moments during the movie the audience felt immense pride for this planet we so often casually refer to as ‘mother earth’. The deeper significance of the term is definitely better understood once you see this movie. I am told that several Hollywood actors were considered for the two lead roles in the movie, but Mr. Cuaron’s final choice was just perfect. Ms. Bullock as the cold but remarkable scientist is simply unparalleled. The investors must have had enormous faith in Ms. Bullock acting prowess and her ability to draw in the crowds since there is little else in the movie besides her, a couple of damaged space stations and a vast empty space. To add to that, there isn’t much speaking either, and whatever little there is, is Ms. Bullock speaking to herself; yet, that does not take away from the rapture of the movie, if anything it enhances the thrill. George Clooney as Ms. Bullock's co- star does his bit, but does not get a chance to show his caliber for reasons I can’t give away. The movie highlights some very socially relevant issues that we seldom like to address. For instance, the space debris build up that nobody talks about, but which may one day become as big of a problem as a polluted earth is today. Then, the movie also prods you to think of the existential question of what it means to be alive, and the responsibilities that come with it, and the next thing you know is the audience begins to introspects and ponders on its raison-d’etres. Now, can a movie do more? hi I Me My, I missed reading your blog, another great review! I wanted to watch this film, I probably will, but these days, I have been very involved on animal activism issues. The pollution created by the livestock in the world is unforgivable, I wish, as you said, that a movie could address it, a big-time sales movie like this one would be great, but there are so many things we overlook... just wishing more people will get informed. It is good to read you again!